This building was officially opened on Tuesday 1st November 1904. In 1910 an addition was built to the right (south side) which is now the Town Library (see picture #376). 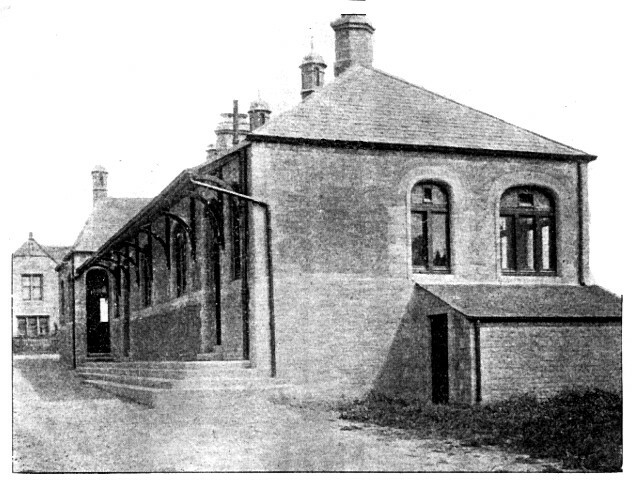 The building shown in the photo was demolished in the 1970s to make way for the school gym. Yikes, doesn't it look foreboding..This building contained a couple of classrooms and science rooms complete with the old bunsen burners. It also contained the Rector's office James Clark (The Jake)..We assembled in the centre area first thing in the morning and were treated to a speech by The Jake and we said the Lord's prayer..and if you looked up into the rafters you would see dozens of the old inkpens stuck up there, the old kind with the knibs on the wooden shafts..These were handed out in class and when the teacher's back was turned they were fired into the rafters...The poor exasperated teacher would then hear "please Miss or Sir, I didn't get a pen" - still makes me laugh to this day! Harry, I wasn't laughing the day I was invited into the Jake's office for 6 from his leather friend. I was caught carving on a desk (again!). He was rumoured to have the most powerfull belt stroke but I dont remember it being any worse than the others. He was a grim man with no apparent light side to his character--what a role model!